Since season one, I have waved the flag for Steven Universe, going so far as to introduce it to my WWAC co-writers. Naturally, I was as excited as any devoted viewer when Cartoon Network announced the “Summer of Steven” in which we’d get at least two weeks of nightly episodes, including a couple of 22 minute specials. I brought that same enthusiasm into the 100th episode “Bismuth,” and after viewing it, I stepped back from my immediate reaction. It is now several weeks and a few episodes later and my feelings of profound dismay remain. It was a painful blow to watch “Bismuth,” which was a fine episode, but the problematic elements prevented it from being a truly great one. On the surface, the episode tells a multifaceted story about a joyous reunion among long parted friends. It is the story of a war veteran discovering that many of her friends had lost their lives in the war she never got to see the end of. It is about the grief, guilt, and rage in Bismuth from not being there to fight or fall with the Crystal Gems. It strongly illustrates post traumatic stress and places a bold underline beneath the saying “War Is Hell.” It is about trust and making new companions, but also about misunderstandings, broken friendships, distrust, and sad partings. All of these topics are dealt with in the usual sensitivity by the Steven Universe team. 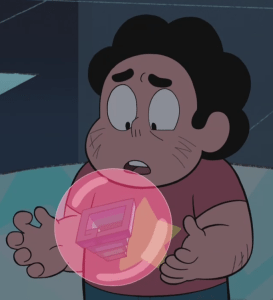 No one person is ever just one thing and heroes are flawed, even the beloved and compassionate Rose Quartz. That the creative team gets so much right is why it’s a major shock to the system when they get things as astonishingly wrong as they did with this episode. That they get so much right is why it’s a major shock to the system when they get things as astonishingly wrong as they did with this episode. Steven Universe, for all the good it does with the racial coding, occasionally missteps, so this wasn’t the first time we’ve seen a race issue treated ham-handedly. The first time was the appearance of Sugilite, voiced by special guest Nicki Minaj. This fusion is not unearthly beautiful like Opal before her, Garnet, or Rainbow Quartz. Sugilite was an ugly, multi-eyed neanderthal-browed monstrous creature. She was ferocious and loved violence. She reveled so much in her strength that she looked for fights and refused to stand down. Her sense of “style” had elements of Garnet and Amethyst’s outfits, only shredded and ripped up haphazardly. Most of the other fusions have real, put-together outfits, but not Sugilite. The ugly and rather unevolved appearance of Sugilite was explained as Garnet and Amethyst not being in sync with each other mentally, so the fusion manifests that way physically, with the less controlled qualities being amplified. 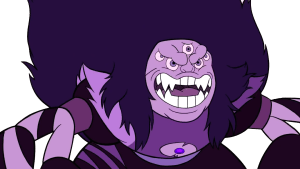 Sugilite is messy, violent, and out of control to the point that Garnet thinks it’s a bad idea to fuse as her again. Sardonyx, which is the black-coded Garnet fused with the white-or-Asian-coded Pearl, is a “much cooler” character, more poised, with more self control, and who sneers “playfully” at Sugilite. She is tidy, fastidious, and a literal performer whose fusion outfit is a tuxedo of sorts, while Sugilite is the worst of Garnet and Amethyst (the Latina-coded character) magnified. Garnet, in the episode that introduces Sardonyx, is treated like an appliance for Pearl so she can feel like the strong one and feel the sense of intimacy she’s lacked ever since Rose went away to birth Steven. The white-or-Asian-coded character gets to do whatever she wants to the black-coded character without even considering the consequences of using someone she calls a friend as well as someone she looks up to. Amethyst even backs Pearl up in her contention that fusion makes them feel stronger. The connotations of using a body coded as black for its strength are staggering in their insensitivity. The show’s implication that Rose Quartz rescued Pearl from literal slavery (the Pearl gems are created to serve) makes this even worse. We get to see Garnet’s sense of betrayal, so strong that it disrupts Garnet’s stable fusion and splits her into Ruby and Sapphire. For Pearl, there’s no remorse. Pearl comes off more sorry that Garnet is mad at her rather than realizing she’s committed a serious violation against someone she’s supposed to care about and respect. Pearl doesn’t seem to get that you don’t treat people that way no matter how lonely and bereft you feel. As if these two fusions and their implications weren’t bad enough, the show introduces another black-coded character in the same ham-handed, ill-considered way. 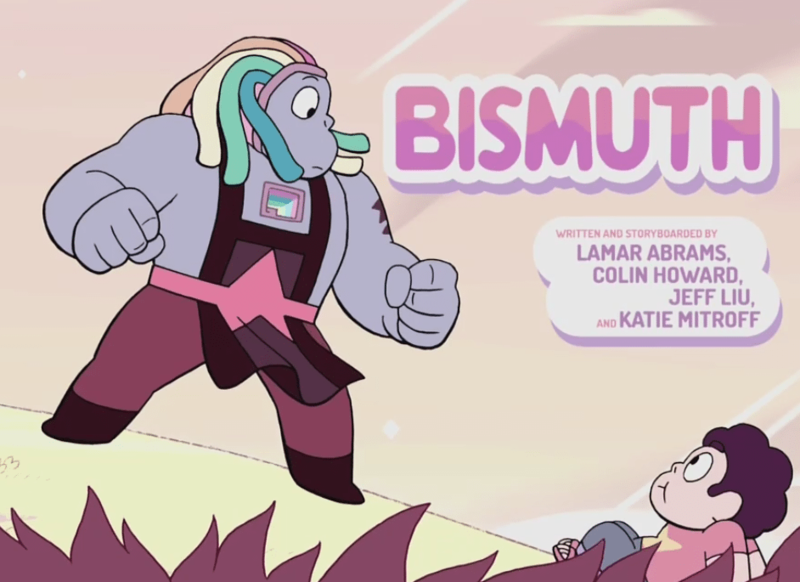 Bismuth, the Crystal Gem introduced in the episode bearing her name, shares several black coded traits with Sugilite and Garnet. Garnet’s afro racially codes her as black. 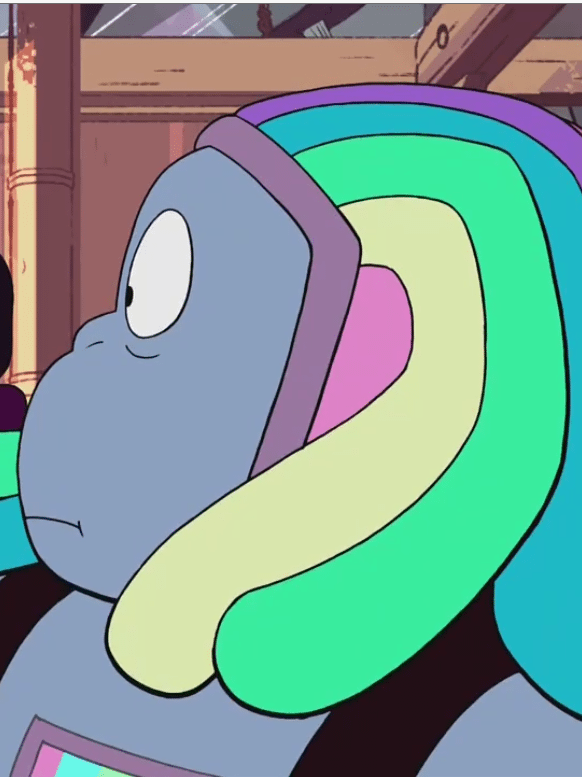 So do Bismuth’s dreadlocks. Like Garnet and Sugilite, Bismuth’s voice actress is a black woman, the incredible Uzo Aduba, who played the hell out of the role. To their credit, Bismuth was given some positive traits. She’s funny, open to new experiences, and generous; however, this doesn’t balance out the problems with the character. 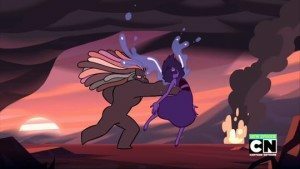 When we see Bismuth form her body–from having been in a bubble since viewers first met Lion way back in season one–the first thing she does is take a fighting stance and keen eyed viewers will realize this may not be our first look at her. We saw someone who looks very much like Bismuth several episodes earlier, in a flashback from Lapis Lazuli in “Same Old World” as the gem who brutally attacked her from behind, hitting her hard enough to crack her gem. This illustrates her as ready to pick up a fight where she thinks it left off. The show’s style seems to lean toward rather unfortunate features for some of their Black coded characters. Bismuth is drawn as large and beefy to underscore her choice to be a blacksmith. From a queer standpoint, it’s a fine physique for a butch woman. From a feminist angle, it’s great for a woman to not have that wasp waist thin figure. Unfortunately, the choice of physique plus the same less evolved cast to Bismuth’s features displays a stunning failure to consider intersectionality. Garnet is coded black, but doesn’t look like Bismuth. Nonwhite characters, like the Pizzas, the Maheswarans, and Mr. Smiley, don’t either. 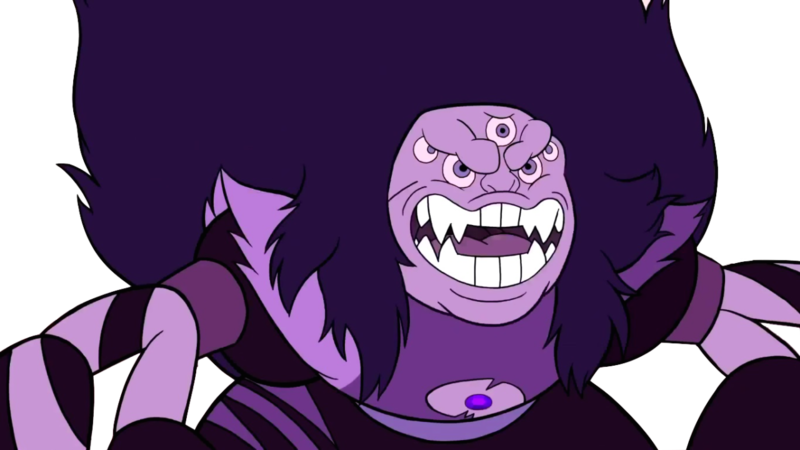 Only Sugilite seems to bear a resemblance. I have to believe that it was a lack of mindful consideration. The presence of Ian Jones-Quartey and Lamar Abrams, who are black, did not seem to be enough to catch these terrible messages before they made it into the episode. The large body and those features paint a literal picture of “black woman as unfeminine” and “black person as subhuman” that is impossible to ignore and painful to see on a show that is usually much more respectful. Bismuth and the Ultimate Weapon. © Cartoon Network. Bismuth and Sugilite aren’t the only victims of the show’s dicey attention to racial situations. Connie, who is otherwise treated respectfully, is submitted to brutal training by Pearl who teaches her to think “I am nothing.” Although Connie is coded South Asian, not black, it’s still problematic. As with Sardonyx, we see this treated as “Pearl’s issues cause her inability to see what harm she’s doing” rather than “the former slave treats someone else like they’re worthless.” There’s no indication whether slavery as we know it took place in the world of the show. But it’s troubling that a character who has experienced it first hand is oblivious to how she treats others. Bismuth is full of deep-seated, seething hatred for the Homeworld Gems, who oppress any Gem who doesn’t follow their mandate to obey without question. This is a clear parallel to racial violence perpetrated on black people for centuries, dating from the colonial days of slavery up to the present. 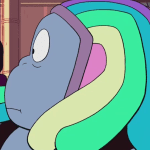 Bismuth has a right to her emotional response. Emotional responses are valid. We’ve seen how cruel the Homeworld Gems are, how brutal their response is to any rebellion, and how punitive and petty they are. Combine those factors, though, and you get another ugly picture. Bismuth is a big, loud, boisterous black woman enraged at her oppressors. She is willing to go to an unconscionable extreme in taking the fight back to those same oppressors. Take into consideration how negatively black anger is portrayed by entertainment and news media through the angry, scary black man and the sassy black woman tropes. I’ve already mentioned elsewhere that “sassy” tends to be used in the context of when a black person rises up out of their place against white authority. Through “respectability politics,” black people have been told for centuries not to fight for our rights, not to demand them, but to gently and respectfully ask for them. This is a disingenuous dodge on the part of the existing power structure or institution who, when asked politely, can appear sympathetic and concerned but ultimately give lip service to change, all the while postponing it for “more immediate” concerns. Through Lapis’ flashback, we see that the Diamond Authority–the Gem institutional power–is made up of sore losers who will sacrifice their own people in order to punish their enemies: The rebels. We’ve seen through Peridot that they don’t allow any backtalk, even when a servant has a genuine point. Bismuth sought to kill Rose for being unwilling to take the fight to the bad guys using the methods the Diamonds used (shattering their gems). She felt Rose valued the lives of the enemy over the lives of her friends and took this as a betrayal, as many people do when being told “don’t fight, ask nicely.” As a result, she was willing to kill Rose and Steven for finding her lethal solution one they couldn’t support. She perceived being bubbled as an indication that Rose didn’t care about her feelings. Her rage is still fresh from being bubbled after her fight with Rose (and unwittingly re-ignited by Steven), and rather than consider ways to talk her away from her extreme approach, the Crystal Gems just sadly accept that she’s too far gone. They put her away with all the other bubbled gems that they “can’t help.” Notably, this makes Bismuth the first and only bubbled Gem who isn’t a victim of the corruption the Diamonds caused–that we know of. Gems are magic. Intent is not. The numerous racial coding failures prove that racism can be so internalized that racist messages appear unconsciously. 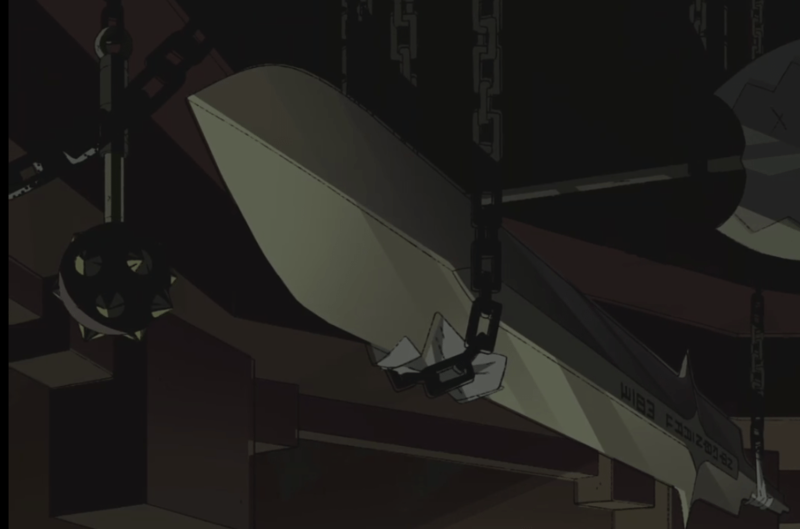 That none of the Crewniverse caught them indicates how entrenched into the psyche it is; no one thinks to look closely for it, so only obvious racism is caught and anything else slips by. This is how racism appears without anyone consciously choosing to perpetuate it. Bismuth’s armory. © Cartoon Network. 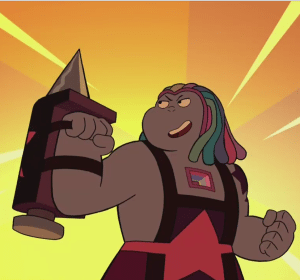 For a brilliant blacksmith, Bismuth apparently never considered protecting her friends’ gems with armor. The Forge is full of weapons and only weapons. Bismuth talked a good game about protecting the Crystal Gems and liberating the oppressed gems from Homeworld, but the fact that there was nothing in her entire creative work was built for protection speaks volumes. More importantly, she doesn’t seem to be aware that as gemstones go, Diamonds are considered unbreakable. Her deadly device would work on Homeworld foot soldiers like Ruby, but stood a very good chance of failing against the Diamonds. (I’m aware of the reveal about Rose and Pink Diamond. It comes to us second hand from a biased source the team spent two episodes establishing as easily tricked). Her “solution” meant shattering gems who worked for the Diamonds without giving them a chance to change sides, an opportunity Bismuth herself was given. Is she incapable of thinking things through because she’s coded black, or is she simply too full of wrath to think through her chosen solution and its consequences? Neither possibility is a good look, as they still come right back to those racial tropes. 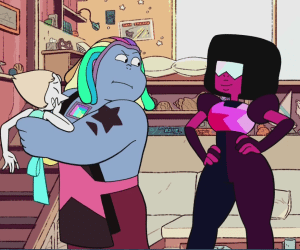 By the end of the episode, this loud, angry black woman–with dreadlocks, animated with distinctly harsher features and an unfeminine physique as compared to the rest of the Crystal Gems, righteously angry at her oppressors, but whose methods are too extreme, and who willingly tars every Homeworld gem with the same brush (This is keeping in mind that Bismuth knows Ruby, Sapphire and Pearl were all Homeworld gems at one time)–has been written off as a lost cause! There’s no changing her mind, so no one bothers to try after Steven fails. They just put her away and accept that there’s nothing more they can do. Yes, it is true in the lexicon of the show “bubbled gem” doesn’t mean dead and gone forever. Any Gem in that condition can come back. The original trio has all been “poofed” as Steven describes it, only to reform a new body later. The same has happened to Peridot, starting off her Heel Face turn as of “Catch and Release.” So while Bismuth can return, there’s a meta consideration that will have in-story effects. Uzo Aduba gave an incredibly poignant, nuanced performance with the role she was given and her return could become a budget issue like it was with Nicki Minaj. If Bismuth returns at all, she could very well, as it happened with Sugilite’s second appearance, be literally stripped of her voice. The team has proven, repeatedly, that they’re competent and capable of handling important issues in eleven to twenty-two minutes. They have consistently been able to deal with complex issues in a respectful and thoughtful manner. That’s why their lack of foresight with Bismuth hits such a jarringly discordant note. They can do better. They have done better. It isn’t a dealbreaker, not for me, though it was for several fans of color. It was disillusioning to encounter a sensitive, emotionally-charged topic they didn’t treat with the same care. I will continue to watch and to call the team out when warranted. That’s the only way to help the show improve. 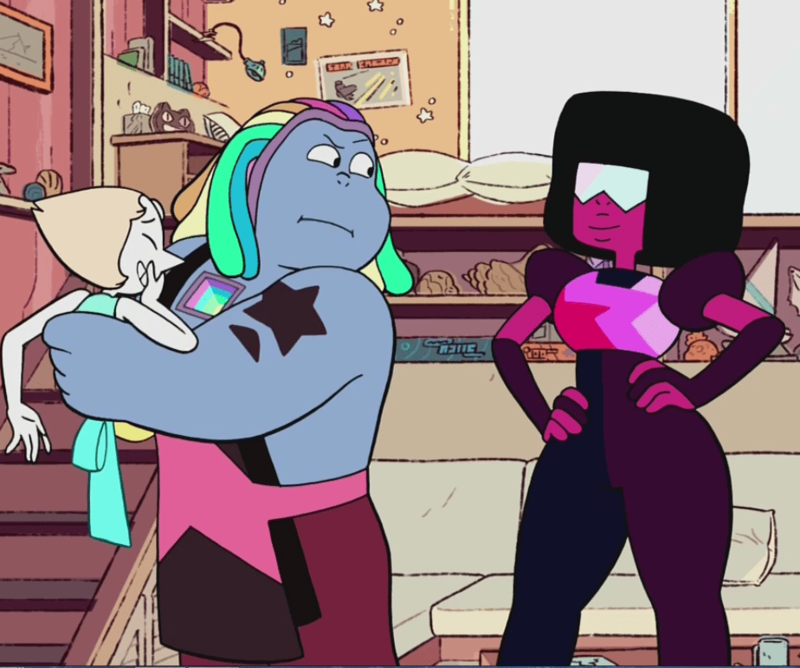 The show polarized the fandom into extreme re actions over whether Rose was wrong or Bismuth was. The truth is neither of them was wholly right or entirely wrong. I urge devotees of the show to step back, as I did, from an instant reaction–whether it is to declare Steven Universe perfect and without fault, to defend Rebecca Sugar and her team against what may feel like an attack, or to insist that Bismuth’s episode had no racism because it wasn’t intended to have any. I encourage fans to follow the example the show itself provides: Be compassionate. Reach inward and find your empathy rather than your anger. Don’t dismiss things just because you dislike them or how they make you feel. The Crystal Gems learned they weren’t always right and their knowledge may not account for new information like in “Warp Tour” and have differed to Steven’s POV ever since. We viewers can take that lesson to heart. The show has so many positive messages to share, and it is important to make sure that when they miss the mark, we speak up so they can get back on the right path.